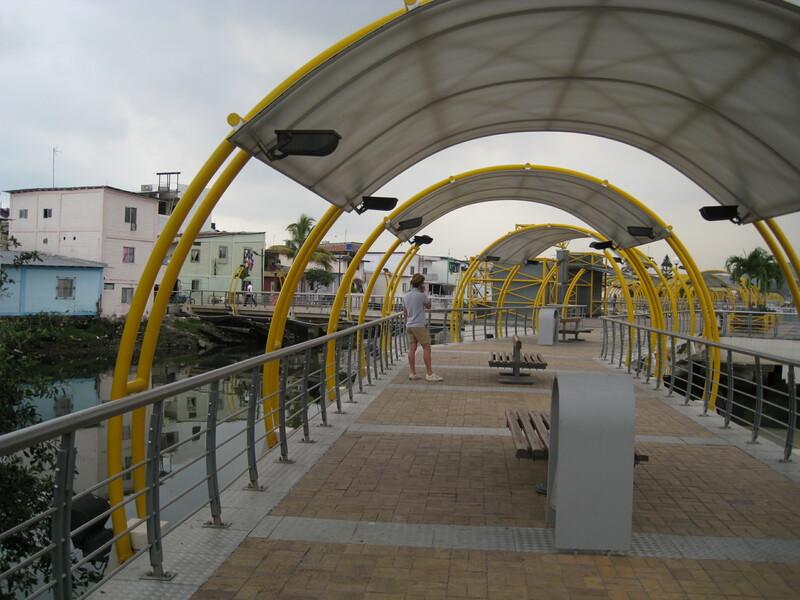 This Waterfront renovation project followed that of the central Waterfront project, the Malecón 2000, which marked the beginning of Guayaquil’s urban regeneration projects and goals. Looking at the map posted earlier, you can notice that the Malecón del Salado (which translates to the the Salado Waterfront) is located on one of the water bodies/marshland in the interior of the city. 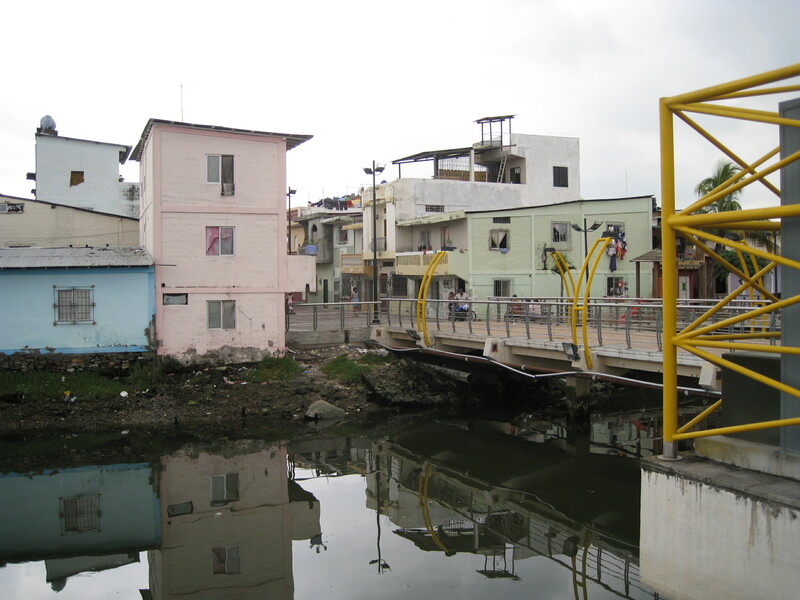 The malecón was built in 2 distinct phases, actually representing 2 distinct areas and approaches for the intervention. 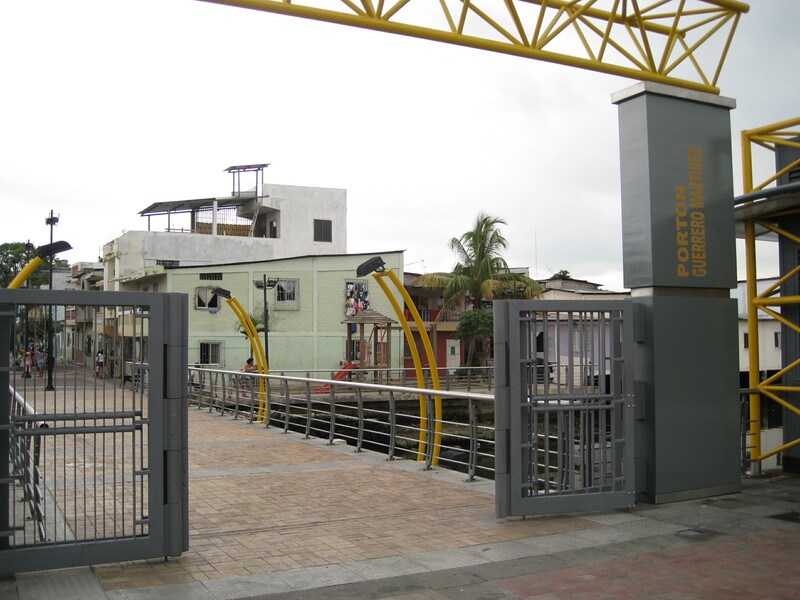 The first is a more formal area, which joins the public university, La Universidad Central, with a public library, School, and Guayaquil’s Tennis Club. Marking the edge of this first phase, is a vehicular bridge and 4 lane street. There is not a pedestrian cross bridge so it is somewhat difficult to cross the street without having to sprint for your life in fear of being run over (needless to say, in most Latin American cities, seeing a person in the street does not make cars stop but on the contrary, it makes them accelerate!). 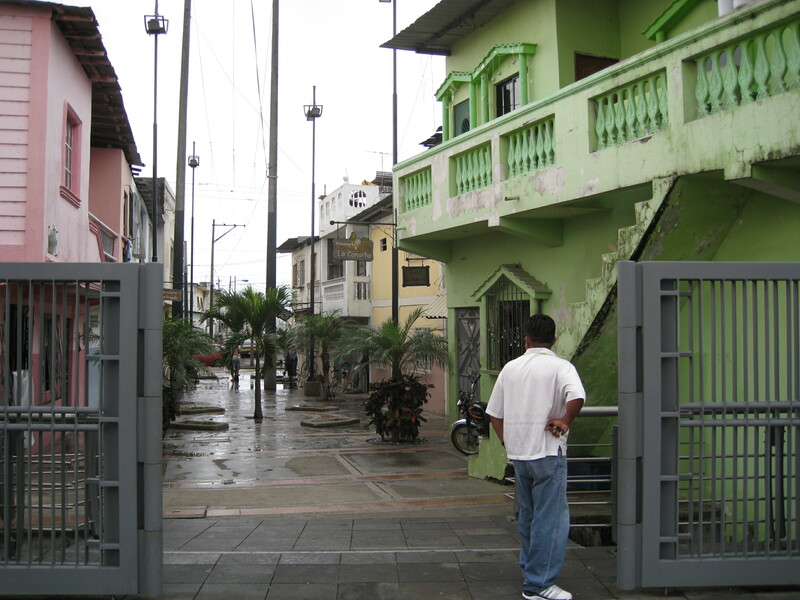 This street, in addition to the gates that border it and the park/ malecón intervention, creates a pretty clear distinction between the areas. This second phase of the project borders what used to be an informal settlement with houses made out or cane and bamboo. 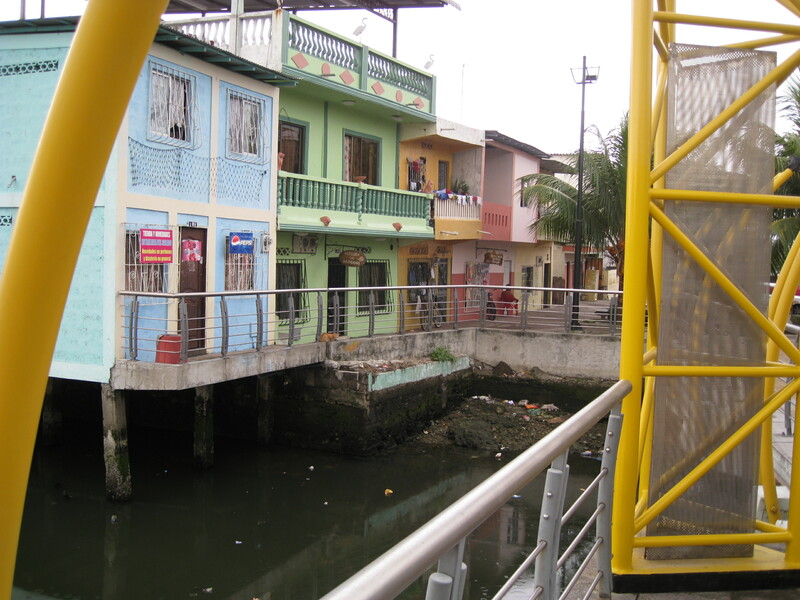 The settlement began in 1960s and slowly evolved into concrete structures. 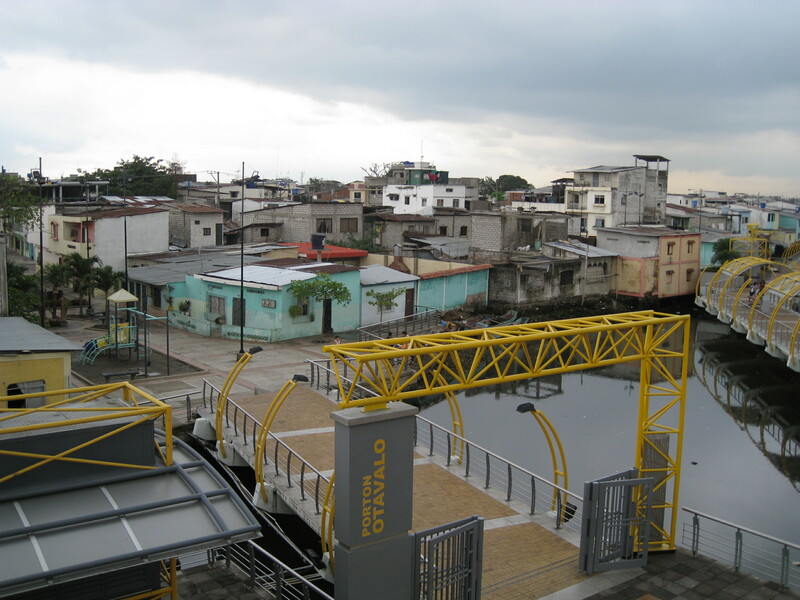 These structures, around the year 2000, got legalized and formalized by the government. 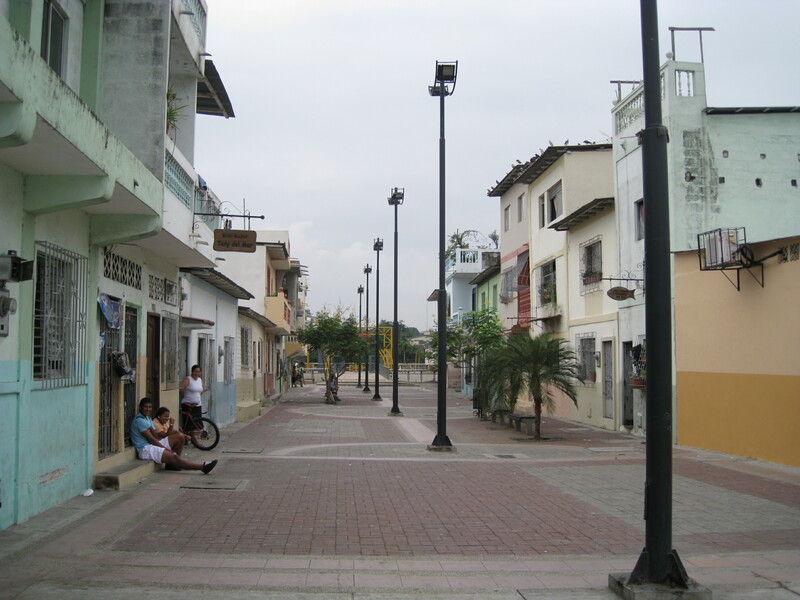 This part of the malecón is 17 blocks long; close to 3 km. 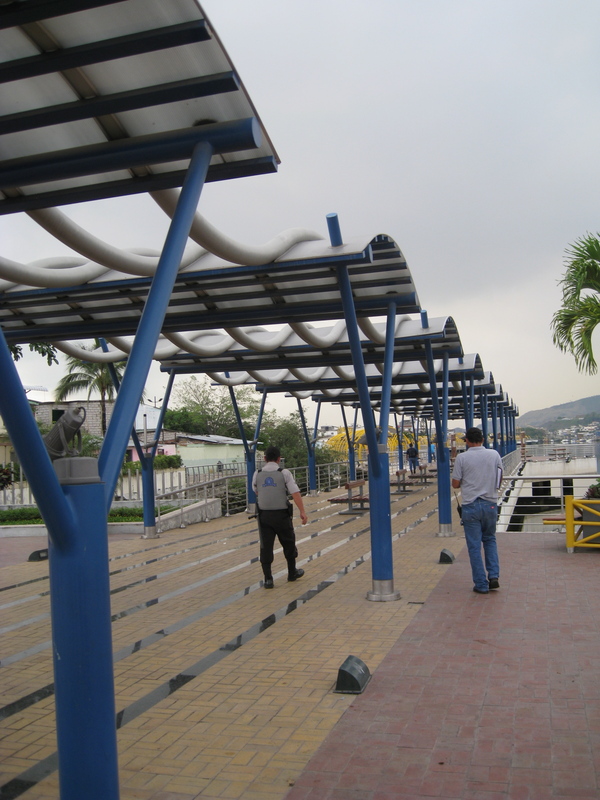 I was told that the government is supposed to keep extending the malecón to reach the next bridge, thus making the intervention about 5 to 6 km total. Nevertheless, there does not seem to be a set date or actual proposal for this to happen. 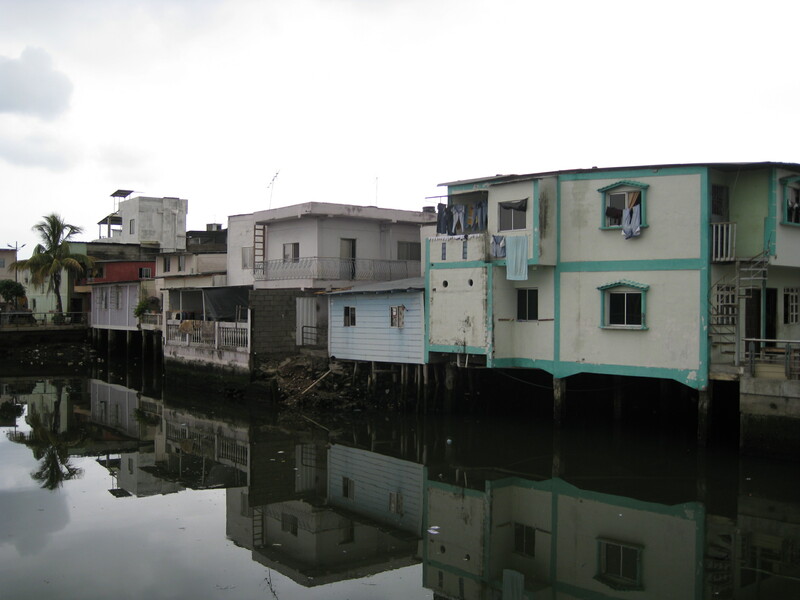 The interesting thing in this part of the malecón is that as soon as one reaches the beginning of the former “favela”, the boardwalk literally separated itself from the land’s edge, floating in the water and running parallel to the land. 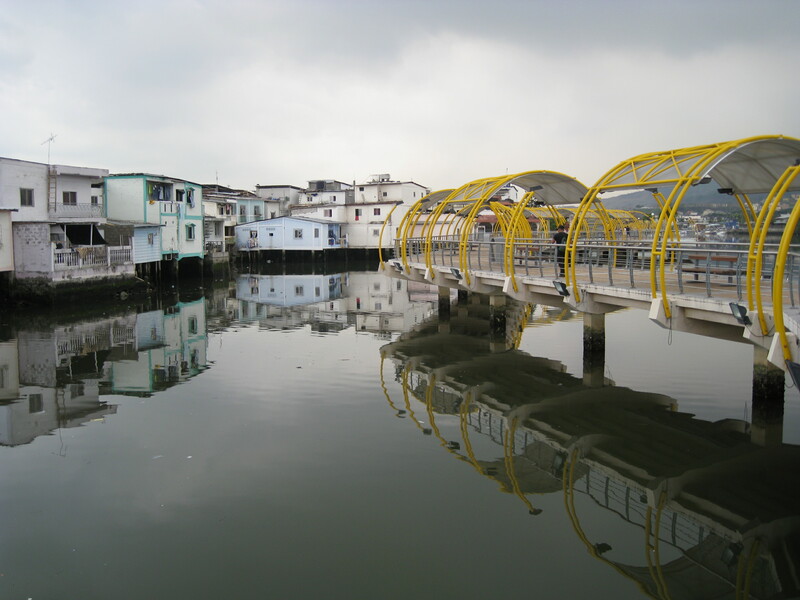 As such, there is a clear division of water in between the edge and the boardwalk itself. 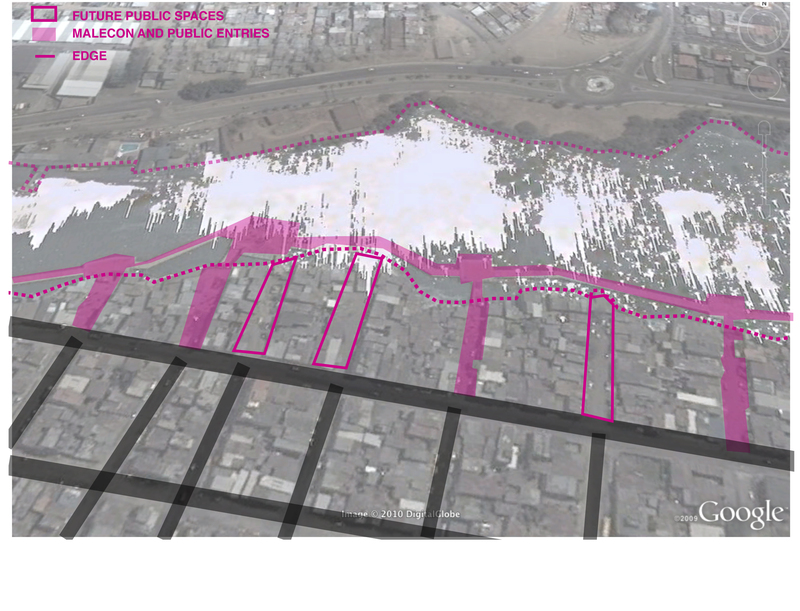 The intervention respected the majority of the urban structure of the settlement, thus minimizing displacement. Apart from the public spaces (which are paved) and the renovated facades around them, the alleyways were also kept and paved. Some alleys were also created. The facades in the alleys were also redone. 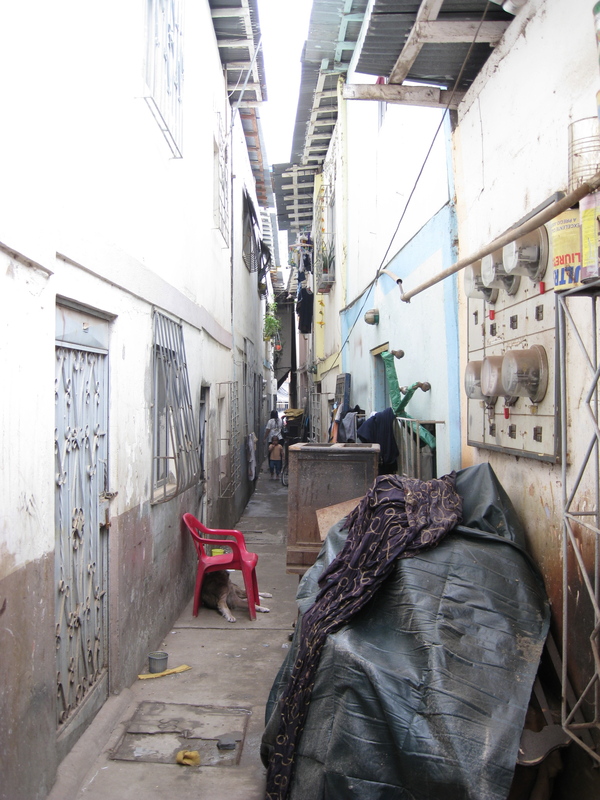 It seems as though one entire family (brother, cousins, grandparents, daughters and sons) live in each alleyway, making each alley a private family community. I don’t want to generalize this, but it was the case for the 3 alleys that I looked at more carefully. From what I was able to notice, an allay way gives access to about 16 houses total, the alleyway being about 8 houses deep. They are usually 1m in width (around 3 feet). Hello! nice site analysis! do you have more info about this location? Im doing a research on unused public space. Thanx!